Today’s post is brought to you by my beautiful friend Alyssa. She recently gave birth to her second child (an absolutely ADORABLE baby girl), and shared the following story with our local mom’s group. This is the story of what she went through following the birth of her son. As soon as I read Alyssa’s story, I knew I wanted to share it with you. For a mother facing postpartum depression, the world can be frightening and lonely. You may be overwhelmed by guilt and fear. I want you to know that you are not alone. You are not a bad mother. Thank you Alyssa for sharing your story. Mama, you are okay. You do not have to walk alone. You are loved. I know this is a subject that I’m not “supposed” to talk about. Our culture is very hush-hush about postpartum depression. I wish this wasn’t the case, and I am hoping that if I speak out maybe others will join me. I know there will be people who will judge me, but there will also be many women who I hope will benefit from hearing my story. I was fortunate enough to have many friends reach out to me during my trial, but I know there are a lot of women who are not so blessed. To all the women who have gone through this or will go through this, I want you to know that you are not alone. To be completely honest, I really didn’t understand postpartum depression until I experienced it. I thought it was something that happened to women who didn’t want to have a baby in the first place. I thought they were just sad and they just needed to deal with it. I also misunderstood PPD for “baby blues”, which is just normal stress from such a life changing event. I was so wrong. I was madly in love with my son from the moment I saw two lines on a pregnancy test. He was always on my mind. I used to love shopping for dresses and shoes, but suddenly all my shopping took place in the baby department. Immediately, this little person growing inside me became more important to me than myself. I was willing to do anything for him. I was horribly sick during my pregnancy, but I didn’t even care. It was worth it. My hand was practically glued to my belly because it was the only way I could “snuggle” him. Every day, I just dreamed about that moment when he would enter the world and I would finally get to meet him. When that day finally came, there was nothing that could have prepared me for it. I was so excited when I realized I was in labor and I was finally going to meet my son, but my excitement would soon disappear. About an hour after receiving an epidural, I turned into a different person. I couldn’t articulate exactly what I was feeling at the time, but I just remember waking up my husband and telling him that I didn’t want Adam to be born. He was so confused. “What are you talking about? You’re going to be a great mother. This is what you wanted!” I didn’t want to be a mother anymore, and at the time I didn’t understand why. Then the moment came, the moment I had been dreaming about for nine months. Adam made his grand entrance. I had always imagined that I would cry with excitement and I would never want to let him go. That is not at all what happened. He came out, I closed my eyes. They put him on my chest, I didn’t even want to look at him. I felt such relief when the nurse took him away. I remember wishing they would never bring him back. I thought things might get better when we got home from the hospital, but it was quite the opposite. I had literally not slept in days, but I couldn’t get to sleep. I would lie awake wondering what I had done with my life. I threw everything away to have this baby that I don’t even love. I would be stuck with him for at least 18 years. I would never get my life back, everything would now revolve around him. I hated to look at him. I hated to nurse him, change him, bathe him. I did it anyway because I knew it was my job, but all it was to me was a “job.” I had no joy in taking care of my own son. I didn’t even see him as my son, he was just some stranger’s baby. Just a side note – unfortunately my problems didn’t stop with PPD; I was also diagnosed with psychosis, which is not quite as common. I would often hear voices in my head telling me horrible things and I would argue with these voices. They would tell me to harm myself or my child, and no matter how hard I tried I couldn’t seem to get them to be quiet. Yes, I was literally a crazy person! This is the part where you might be thinking, “Wow, what a horrible mother! Didn’t you know having a baby would be hard work? You just weren’t ready for it!” I’ve received comments like this by people who do not understand postpartum depression. I knew having a baby would be hard work, but it was all I wanted. My whole life, I’ve always wanted to be a mother; I wanted to change dirty diapers, be awake with a crying baby at all hours of the night, deal with tantrums, and wipe snotty little noses. In my mind, it would all be worth it to raise a child and grow a little person into a respectable adult. People often fail to realize that postpartum depression has nothing to do with your circumstances. I had everything I’ve always wanted; a wonderful husband and a healthy baby boy. I had every reason to be the happiest person on earth, and yet I was more miserable than I have ever been in my entire life. Postpartum depression is completely irrational. It was very strange to have the knowledge that my thoughts and feelings were completely illogical, and yet still be unable to control them. There was literally nothing I could do to be comforted. I would cry for hours and hours and never feel any relief through my tears. I would often just sit and stare at the wall because I didn’t want to do anything. I would frequently have panic attacks that were completely unrelated to anything Adam was doing, but as soon as he started crying I would freak out as if the world was coming to an end. I was unable to handle anything negative or unpleasant. I would often pace back and forth in the living room trying to wrestle with my horrible thoughts. You can officially write me off as crazy, but I felt as if there was someone else in my head telling me what to think and I was trying to scream back, “no, that’s not true!” I thought I was a horrible mother and I just never should have had a baby. Suicide was always on my mind. It got to a point that I realized I needed help. My doctor gave me a prescription for antidepressants, and I really wish I had taken them sooner. I was very reluctant because I didn’t like the fact that I would have to take this medicine just to be “normal.” I wanted to get better on my own without medication, but I realized that wasn’t going to happen any time soon and I was only getting worse. My doctor explained to me that my depression was being caused by a chemical imbalance in my brain as a result of hormonal changes after the epidural, and this prescription would reduce the amount of this over-producing chemical. I gave it a shot, and I’m so glad I did. Within a couple weeks, I started to feel like myself again. Within a month, I was finally able to love my son the way I did when I was pregnant. I have been taking antidepressants for almost five months now, and I have absolutely no symptoms of postpartum depression or psychosis. I love my little boy more than words could ever describe; I love his smile, I love his little face and his little feet and his little hands, I love the way he “talks” to me every time he sees me. I love nursing him, changing him, giving him a bath, and kissing him goodnight. I love every moment with my son, and I hate to be away from him even for ten minutes. Even on the hard days (and trust me, there’s a lot of those), I still love him to pieces. Sometimes he makes me mad, but all he has to do is stare at me with that big toothless grin and instantly I can’t stay mad at him. I don’t know how I would be right now if I didn’t take medication, but I can assuredly say that it would have taken a lot longer for me to get back to normal if I hadn’t sought help. Before I was diagnosed with postpartum depression, I knew very little about it. How can this be when 20% of women are diagnosed with it? Because women are afraid to talk about it. This is an affliction that causes you to change into an entirely different person; it turns you into an awful, baby-hating monster! Speaking to the women who have gone through this or who will go through this, it is NOT you fault! This condition causes you to temporarily become someone that you are NOT. My advice is to seek help as soon as you start to recognize the signs, whether by counseling or medication, just get help. If you choose antidepressants, don’t feel guilty about your decision; you would treat a headache with medication, so why wouldn’t you treat depression with medication? Postpartum depression is a real affliction, and it is not caused by your own thoughts or fears. 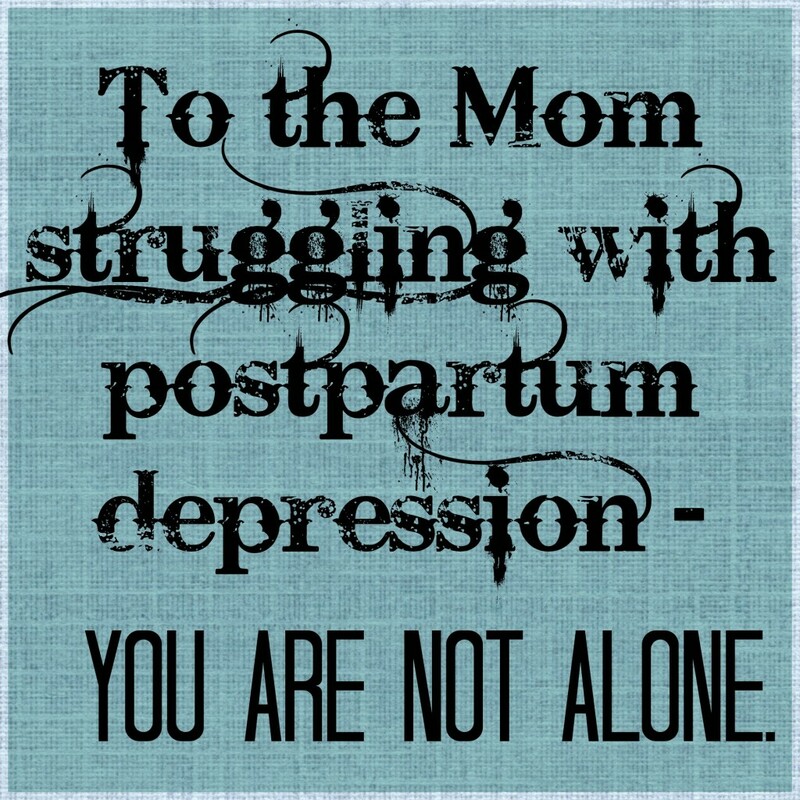 If you’ve gone through postpartum depression, I encourage you to share your experience. I wish more women knew about it when they were pregnant so it wouldn’t be a surprise to them if they got it after delivery. I wish more women who do have it would not have to be so ashamed and guilty, or feel like they are alone. You are not alone. So many women have gone through this without anyone ever knowing about it; I don’t want that to be the case for me. Please Share this with the moms you know. Don’t let another mom suffer alone. You are loved. Thanks so much for this thoughtful article. I have a friend with a new baby who’s been moody after she delivered, and I’ve wondered if she might have some depression. This has been very helpful. Thank you for sharing your story. More women need to. Im glad you were able to seek help and become the mommy you always wanted to be. Thank you so much for sharing! Since I started blogging about PPD, I’ve learned that way too many women keep silent when they should speak up. It makes a world of a difference to know that we’re not alone. Thank you so much! I was just recently diagnosed with Postpartum Depression. I am currently taking antidepressants so I’m hoping they work. It definitely has been a huge eye opener dealing with this. Just reading about different experiences has eased my guilt tremendously. God bless! !